LAS CAMPANAS OBSERVATORY, Chile — Construction of the world's biggest telescope is now underway. A star-studded groundbreaking ceremony here in the Chilean Andes Wednesday evening (Nov. 11) — attended by Chilean President Michelle Bachelet, United States ambassador to Chile Michael Hammer and other dignitaries — officially ushered the $1 billion Giant Magellan Telescope (GMT) into the construction phase. 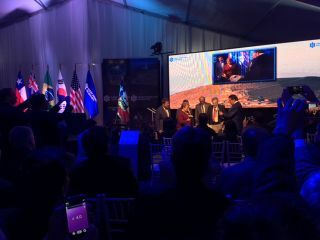 "The GMT will revolutionize our view and understanding of the universe," Taft Armandroff, chair of the Giant Magellan Telescope Organization (GMTO), said during the ceremony, which was held inside a large white tent whose roof and sides were shaken continuously and loudly by the powerful Andean winds. "It will be remembered in the science textbooks written hundreds of years in the future." It will take a while for the massive, complex GMT to take shape here at Las Campanas, which lies 8,000 feet (2,450 meters) above sea level about 2.5 hours by car northeast of the coastal city of La Serena. First light is expected in 2021 or 2022, and the telescope should be operating at full strength a few years after that, GMTO representatives have said. "We're well on our way," GMTO Interim President Pat McCarthy told Space.com in Santiago Tuesday evening (Nov. 10). "But there's a lot more to come." When it's finished, the GMT structure will be about 22 stories tall. The telescope will feature seven primary mirrors, each of which is 27.5 feet (8.4 m) wide. These mirrors — the largest single-piece optics ever built — will be arranged to give the observatory a light-collecting area 82 feet (25 m) across. GMT will also have seven smaller secondary mirrors, which will comprise an adaptive optics system that counteracts the blurring effects of Earth's atmosphere. Four of GMT's primary mirrors have already been cast, in a spinning furnace at the Richard F. Caris Mirror Lab at the University of Arizona's Steward Observatory. But casting is just the first step for these huge mirrors. They also must be ground and then polished with incredible precision, to give them surfaces that are perfect to within 20 nanometers — about the width of a single glass molecule. This exacting work is already done for one mirror, while the other three are in various stages of the lengthy finishing process. The current plan calls for starting science operations with the first four or five primary mirrors, perhaps in late 2021, GMTO representatives have said. The other mirrors will be added as they're finished, probably at the rate of one per year or so. The Mirror Lab will make a total of eight primary mirrors, so that GMT can keep operating at full strength when individual mirrors need to be re-coated with reflective aluminum. Each big mirror will require such maintenance work every two to three years, Steward Observatory director Buell Jannuzzi, who also heads the University of Arizona's astronomy department, told Space.com. Chile is an earthquake-prone nation, so GMT is being built with temblors in mind. The observatory's design requirements stipulate that it be able to withstand an extremely powerful quake — the kind that occurs just once every 500 years — with only minor repairs necessary, McCarthy said. Artist's illustration of the Giant Magellan Telescope (GMT), which will be built atop Las Campanas Peak in Chile. The observatory will likely begin science operations in 2021 or 2022. When it's up and running, GMT will help researchers tackle some of the biggest questions in astronomy, the telescope's developers say. For example, GMT will be able to search the atmospheres of relatively nearby exoplanets for oxygen, methane and other "biosignature" gases that could be signs of alien life. Astronomers will also use the observatory to peer back near the beginning of the universe's 13.8-billion-year history, capturing views of some of the first-ever stars and galaxies. In addition, GMT will help scientists probe the nature of mysterious dark energy and dark matter, which together make up 96 percent of the universe but are poorly understood. These are some of the areas in which GMT should make meaningful contributions. But it's impossible to predict just what the telescope will discover, McCarthy and other GMT team members have stressed. GMT will add to Chile's already substantial astronomy bona fides. The nation's dry, clear mountain air has been attracting astronomers for decades, and more big observatories will be built here in the future. Indeed, Chile will host about 70 percent of the world's astronomy infrastructure by the year 2020, according to some estimates, Hammer said. "We are going to continue providing support to this and other new projects," President Bachelet said in Spanish at the ceremony. (An interpreter translated her remarks in English.) "We have to continue exploring and collaborating." The GMT project itself is a model of international collaboration. Its partner organizations include Astronomy Australia Ltd., The Australian National University, the Carnegie Institution for Science, Harvard University, the Korea Astronomy and Space Science Institute, the São Paulo Research Foundation (FAPESP) in Brazil, the Smithsonian Institution, Texas A&M University, the University of Arizona, the University of Chicago and the University of Texas at Austin. When it begins science operations, GMT will be the biggest optical telescope by more than a factor of two, McCarthy told Space.com in late September. Adding the remaining mirrors will make it even bigger, of course. But GMT won't be the world's largest scope for long. It will lose that title to the Thirty Meter Telescope (TMT) and the European Extremely Large Telescope (E-ELT), both of which are scheduled to come online in the mid-2020s. TMT, which is being built in Hawaii, will be 98 feet (30 m) wide, as its name suggests. E-ELT will be even larger when it's up and running in Chile, featuring a light-collecting surface 128 feet (39 m) across. Both TMT and E-ELT will integrate hundreds of relatively small primary mirror segments, in contrast to GMT, whose design calls for seven large mirrors. All three observatories will be capable of big things, and their placement — two in the Southern Hemisphere, one in the north — will allow astronomers to study broad stretches of the night sky. In short, the future of astronomy is very bright, especially considering that NASA's $8.8 billion James Webb Space Telescope is scheduled to launch in late 2018, McCarthy said. "About seven to 10 years from now, there will be observational capabilities that are completely unprecedented," he told Space.com in late September. Mike Wall is visiting Chile for the Giant Magellan Telescope groundbreaking ceremony on a trip paid for by the Giant Magellan Telescope Organization.